Rio's dam Dunja is a Yak Frankengold daughter. Yak is also the Sire of VA2 Odin vom Holtkamper Hof and VA4 Ilbo vom Holtkamper See (German Sieger Show 2008). VA1 Irish Sieger Male 2010 & 2011. A dog of correct size, excellent pigmentation, dark mask, strong substantial masculine male, correct front, high wither, straight back, well angled long croup, pronounced hind angulation, firm hocks, very correct fore angulation. Free front reach and powerful hind thrust. European Junior Winner 2009 - Crufts Qualifier for 2010. This young dog impressed me because of his exceptionally striking expression and really strong pigment, his very correct size and balanced proportions. He also displays a quality missing in so many dogs today - that is, that he is capable of 'trotting'. 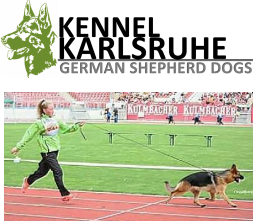 V3 Open Dog; All Ireland German Shepherd Dog Association Breed Championship Show May 22nd -Judge Herr Bernd Weber SV. V4 Open Adult Male (Class of 12) Ulster GSD Club Breed Championship April 22nd- Judge Anders Eriksson SV. Rio now resides with our friends in County Kilkenny, Contact Us for any further enquires.